I have had canteens and bowls by Gwen, but this is the first time I have bought her marvelous tiles. This large piece, like a painted canvas is fantastic. Gwen has painted so many lovely Hopi symbols on this handmade piece. 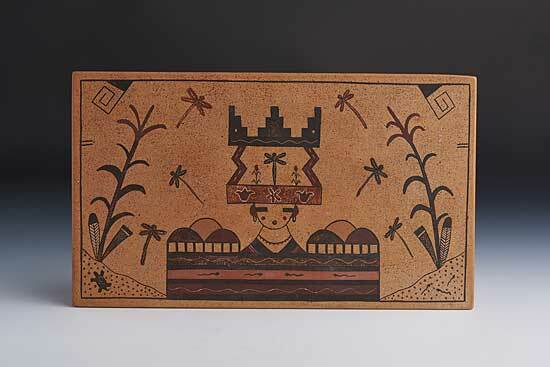 It features corn maiden, dragonflies, clouds, turtles, water, tadpoles and a most beautiful Tablita on the head of the maiden. There is such a warm hue in coloration on this tile; just magnificent! Gwen “Aas-Ku-Mana” (Mustard Juice Girl) Setalla was born into the Hopi Reservation in 1964. She is a member of the Bear Clan and the Water Clan. She started making pots when she a little girl of five years old! 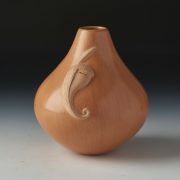 She has been an active potter since 1985. She was primarily taught by her mother Pauline Setalla with added lessons and experience from her godmother, Rainy Naha and members of the Navasie family. 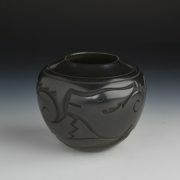 Gwen is known for her thin walled pottery with expertly painted traditional Hopi designs. Gwen is always reminded of what her parents taught her as a child, “when creating a pot, you bring it to life and you breathe life into it, always treat it with the greatest respect”. She prays a silent prayer for every pot she creates and thanks all the great spirits for blessing her with this talent to continue a long live legacy. She signs her pottery: Aas-Ku-Mana, Hopi, followed by a Bear Paw to denote her clan origin. She also copyrights every piece she creates. Gwen is related to Joy “Frogwoman” Navasie (aunt), Eunice Navasie (aunt), Dee Setalla (brother), Charles Navasie (cousin) and Stetson Setalla (brother).